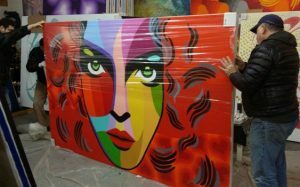 As a New York-based company specializing in moving and shipping fine art of any kind, Fine Art Shippers provides a full range of artwork moving services both locally and nationally. However, while Fine Art Shippers operates across the country, art moving in NYC is still our main passion. After all, this ever-busy city is home to some of the best artists from around the world. Moreover, you won’t find such an amazing concentration of art, galleries, museums, shows, and various art events elsewhere, which makes fine art moving in New York City an exciting adventure filled with many interesting opportunities. 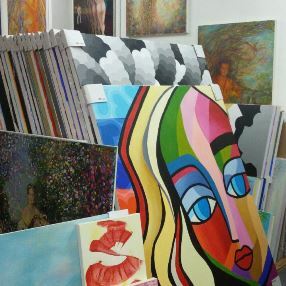 Throughout our art moving experience in NYC, we have worked with many talented artists, providing them with comprehensive art packing, moving, and installation services on a regular and urgent basis. 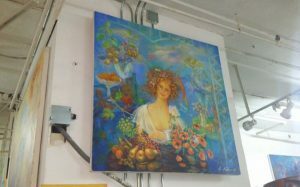 In this blog post, we want to tell you about Vladimir Nazarov and his incredible paintings we were lucky to move. Known for his innovative use of color, layering, and space in symbolic abstraction, Vladimir Nazarov is definitely one of the most prominent and amazing contemporary visual artists living and working in New York City. His works inspired by nature and different cultures are all about an open-ended, emotionally-charged treatise on the human condition, which makes them unique not only the way they look, but also the way they affect people. 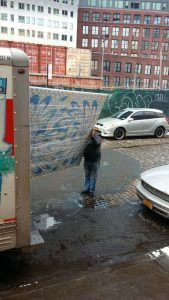 For this reason, it won’t be an exaggeration to say that Vladimir Nazarov is one of those artists who make our art moving work in NYC a sheer pleasure. 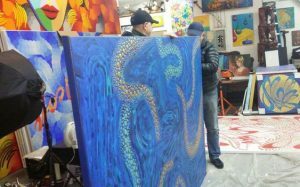 Not so long ago, Fine Art Shippers had an amazing experience visiting Vladimir Nazarov in his impressive studio in Dumbo, Brooklyn, New York, and helping the artist prepare for the upcoming exhibition. It should be noted that most Vladimir Nazarov’s paintings are over 8 feet tall, which makes it pretty challenging to safely move and install them in the way they deserve. 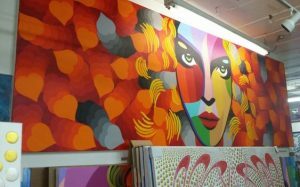 However, since Fine Art Shippers has extensive experience in moving fine art of any size, including paintings that are 8 feet, 10 feet, 12 feet tall and even larger, it was not a problem for our team to complete this job in the most professional manner possible. 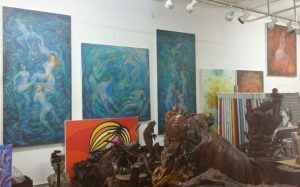 In general, art moving in NYC with Vladimir Nazarov was indeed an amazing experience for Fine Art Shippers. We wish tremendous success to this inspiring artist and are looking forward to working with him in future!